I hope you all had an awesome holiday weekend filled with lots of fun and relaxation! Alas, the long weekend is over now, so it’s back to work for me. Of course, as I touched on last week, getting to and from work is now the highlight of my day instead of the rage-inducing punishment it felt like when I drove. 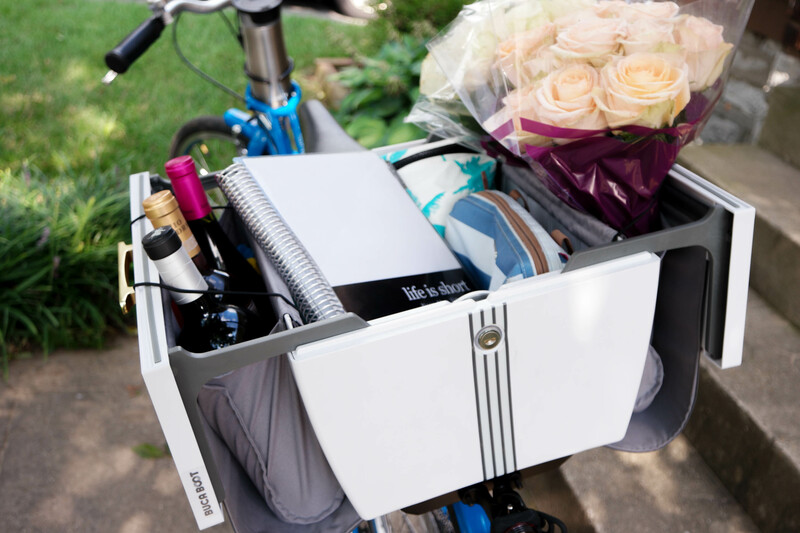 Aside from being in love with biking, I’m also on a permanent mission to find chic bike-friendly accessories to make it even more awesome. After all, a little extra prettiness just makes everything better, doesn’t it? I’ve rounded up a few of my new and old favorites, plus some tips and tricks that make the commute more effortless. 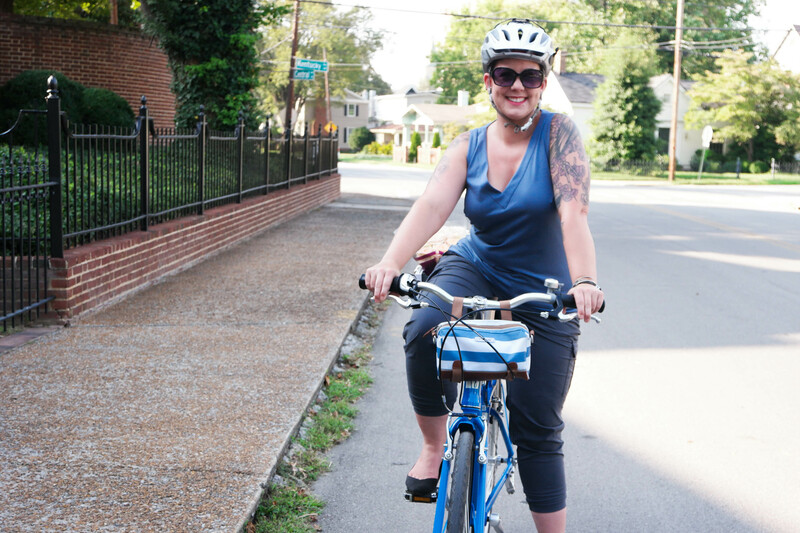 When I first started biking to work, I didn’t struggle much with what to wear. My ride was around 8-9 miles each way, so it just made sense to wear workout clothes & sneakers, then change when I got to work. Now that I’ve got a short commute, going through that whole song and dance seems a little bit silly. Not to mention I’m also biking to other places like the grocery store or out to eat, and I’m definitely not bringing a change of clothes with me everywhere I go. Of course, the legality of biking around town naked is questionable so I had to figure something out. After lots of experimenting, I’ve come to two conclusions. For one, it helps when I buy my casual clothes with the same mindset that I shop for workout clothes. In other words, I’m looking for breathability, moisture wicking and fabrics that dry quickly. That doesn’t mean I’m limited to hiking duds all day every day, but I do gravitate more toward everyday styles made of technical fabrics. Discovery number two: pants take most of the bike-related wear & tear, and synthetic fabrics hold up a lot better in my experience. I haven’t completely sworn off linen pants, but I save them for days when I know I’ll be spending most of my time in the office. Lately I’ve been pretty in love with my prAna Sage Joggers*. They’re relaxed enough to move easily in, and they dry really fast if I get caught in the rain – or if I get sweaty, which is pretty much always. 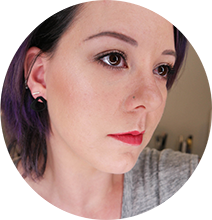 (Pssst – they’re also giving Lipstick Latitude readers 15% off through Oct 3rd – you can use the code MHMNG15). Shoes-wise, I’ll go ahead and mention that I love my Rothy’s as much for riding a bike as I do for everything else. The snug fit means they don’t fall off – and trust me, I’ve had to go back for other lost shoes more than I’d like to admit – and if they get dirty I just toss them in the wash. The knit upper doesn’t show creases from where I drop a foot down to stop, either. Bike hack: For bike-friendly footwear, platform pedals and rubber soles are a match made in heaven. Platform pedals don’t require bike-specific shoes, and rubber soles have the traction you need to keep your foot from flying off the pedal. If your favorite shoes have leather outsoles, you can get non-skid pads that adhere to the bottoms. Since biking is my preferred mode of transport these days, lugging stuff around in a bulky bike pannier just isn’t doing it for me anymore. Usually I try to keep what I carry to a minimum, but there are certain things I just can’t go without. Phone, keys, wallet. And coffee, because I’m completely useless until I’m fully caffeinated. In the past I’ve used regular crossbody purses to carry small stuff while I ride, but to be honest I’m not really a huge fan of it. They get hung up on the seat when I hop down at a stoplight, and they always seem to swing around to weird positions at inopportune times. 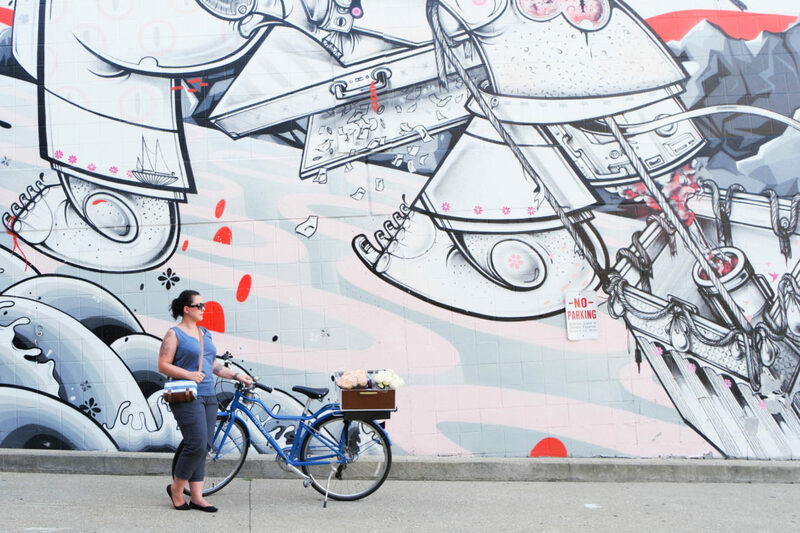 Which brings us to Po Campo – they make casual bags that just happen to have some sweet bike-friendly features. I’ve been using their Kinga handlebar bag*, and let me tell you, they’ve thought of everything. A loop & velcro strap system attaches it to the handlebars for the trip, and then tighten out of the way while you’re wearing it. The fabric is weather resistant with a subtle reflective stripe, and there’s even a little pocket on the back to tuck the shoulder strap into while it’s on the handlebars. It’s one of those companies you can feel good about buying from too – the ‘leather’ trim on their bags is all vegan leather, and they donate a portion of their sales to World Bicycle Relief to help make education accessible for girls & young women in rural Africa. I can get behind that! The other life essential that I have to carry to work with me is the aforementioned coffee – I swear, it should have its own spot on the hierarchy of needs. After buying one on a friend’s recommendation, I refuse to use any other travel mug for my commute except the Contigo West Loop Autoseal. It fits in most bottle cages I’ve tried, keeps my drink hot for hours and most importantly, I’ve never had a leak in the year or so I’ve been using mine. I will say my purple one has gotten a little scratched up (probably because I dropped it while walking and it may have bounced down the sidewalk…) but you can’t beat them for pure functionality. 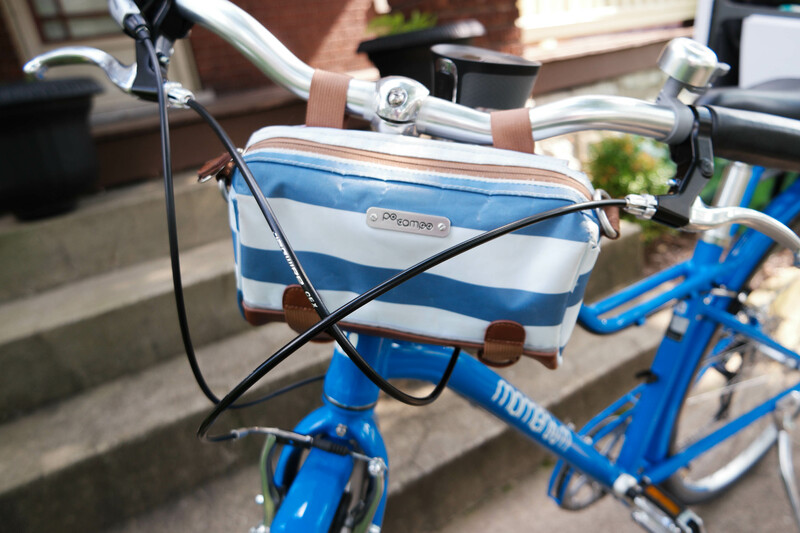 Bike hack: If you’re not into carrying a purse, a seat bag is another great option to stash your necessities while you ride. Carrying stuff in your pockets? Not even once (trust me on this). Helmets are hands-down the dorkiest biking necessity and as you can see above I’m still rocking a regular road helmet (from Specialized). Luckily there are some new options on the market that look good and keep those big beautiful brains safe. I’ve got my eye on these two from Dashel and Thousand. Both are incredibly minimal and elegant, but they each have their own special features. Thousand has a built-in lock port where the logo is, so you can lock your helmet to your bike and not worry about toting it around with you. I have a hard enough time figuring out what to do with a purse when I’m in a restaurant, so not worrying about my helmet is a bonus. Dashel, on the other hand, is made of carbon fiber so it’s really light (350g – something you normally only find with foam road helmets) and has a cool equestrian vibe that would fit right in here in Lexington. They’re currently only certified for Europe, but I spoke to the founder and they’ve got CPSC (American) testing in the pipeline. I’m a little torn on which one to pick – decisions, decisions…. Bike hack: If you’re worried about your helmet wrecking your ‘do, satin is your friend (especially for curly hair). Putting a satin bonnet or scarf over your hair will keep helmet pads from snagging the strands & causing frizz. Also: in my experience french braids are the ultimate style for avoiding helmet hair. Up until recently I’ve been using a Koki bike pannier (which is now discontinued), but as with other things, it was better for a long commute than riding around town. For one, it’s kind of bulky and very obviously a bike bag. Also it’s looking a little rough these days, even though it’s structurally fine. In other words – I just wanted something new even if I didn’t technically need a new cargo solution. Then I found something I’ve been wanting for years – a lockable trunk for my bike. Convenience, thy name is Buca Boot. At $225 it’s a little more expensive than a pair of high-quality panniers, but oh, the things you can carry! You can lock the lid shut while you ride (duh), but if you leave it open the lid and sides turn into extra panniers. Each one will hold 3-4 bottles of wine (I swear that’s a standard unit of measurement for volume). The inside compartment is plenty big enough for the bag that carries my rain jacket/repair kit/air pump with room left over for my lock, lunch, planner, etc. It does make the bike a tiny bit back-heavy, but that’s only a concern when I’m carrying it up the stairs into the house. I’ve only been using it for a short time, but so far I think the purchase was well worth it. 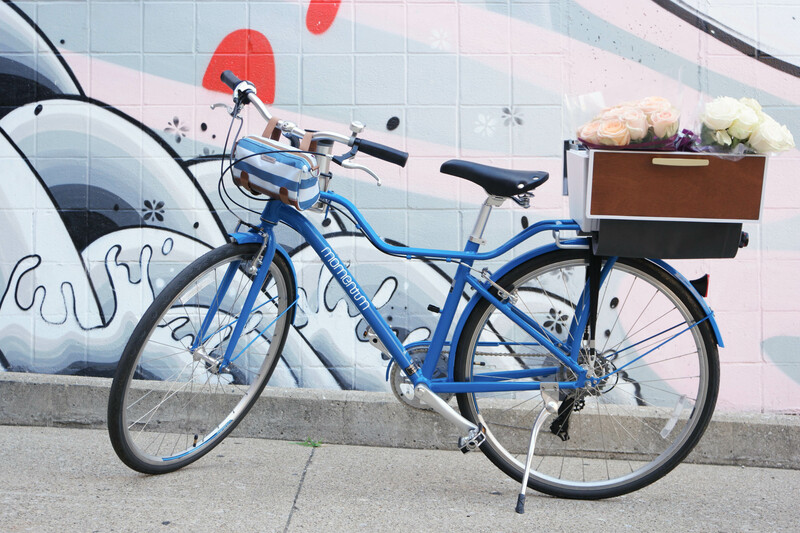 Bike hack: Stow a few bungee cords on your bike by tossing them in your carrier or wrapping them around the rack. You’d be amazed at how much extra stuff you can carry by strapping it to the rack, handlebars, top tube… well, you get the picture. What are your must-haves for your commute (bike or non-bike)? You make me want to live on my bike more. Thanks for all the great tips! Versatility is so important for such a commute. My bike is out of commission but this makes me want to ramp up the repair process! Oh no, what’s wrong with it? Great article! Thanks for featuring us amongst a lovely pick of brands. 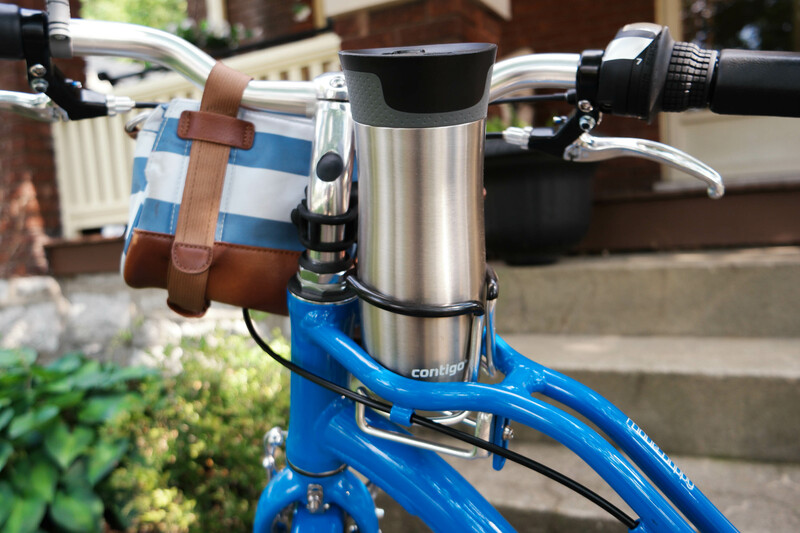 I wonder if I could fit a Contigo to my Brompton…. Wow. These accessories are must-haves. I will surely get them all! Thanks for sharing this. Great bike too. Love the whole top tube / rack concept. No more rack failures. Why did it take someone so long to build a frame that puts coffee first? One more time…….. Great bike.